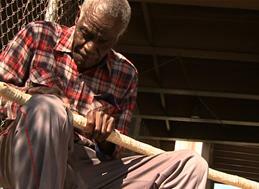 Stickman is a deeply moving documentary about homeless man Roosevelt Wilkerson, whose passion for carving walking sticks connects him to a world beyond the streets and launches him on an incredible journey. Along the way Roosevelt is helped by many from the local community. Art enthusiast Carol Brewer befriends him and their relationship is the genesis of an art program for the homeless that helps hundreds. Texas socialite Susan Nowlin becomes his benefactor and manages a successful distribution business for his hand-carved sticks. His sticks reach the hands of numerous celebrities and world leaders. One is even gifted to Pope Benedict XVI by then President George W. Bush. With the proceeds from the business and the help of others, Roosevelt is able to move into a home of his own. Within the backdrop of the American South, with its history of slavery and segregation, the film shows how the power of the human spirit can overcome the rigid boundaries of social class and race that still pervade the fabric of the American experience. Revisiting that age-old question: “Is it better to give than to receive?” the film shows that love, compassion, and charity are reciprocal and ultimately benefit all parties involved. Stickman has been near completion for over a year now. Sadly Roosevelt Wilkerson passed away late last December. He was unable to see the film finished. We are determined to complete this film so that Roosevelt’s story – his struggle, his life lessons, and ultimately his humor, wisdom and love- can live on. We are sure, that his life’s story will touch, inspire, and uplift countless numbers of people. To complete this film, we need your help to raise money to pay for additional editing, television rights, sound mixing and music. All donors will be acknowledged in the credits of the film, unless they specify otherwise. Most importantly, through your financial support, Roosevelt’s life and legacy will reach thousands or people across the country and the world. All donations made through this website are tax-deductible. To see the film trailer and to get more information about the film you can go to our website: www.stickmandoc.com. If you have additional questions please contact the director at galbraith.margaret@gmail.com.